In the end, Melbourne didn’t hold on to pick six for long at all. Instead of holding tight in one of the (alleged) strongest draft classes in recent memory, the Demons have decided to flip one of the picks they received in the Hogan deal to address their biggest weakness from the 2018 season – their defence. 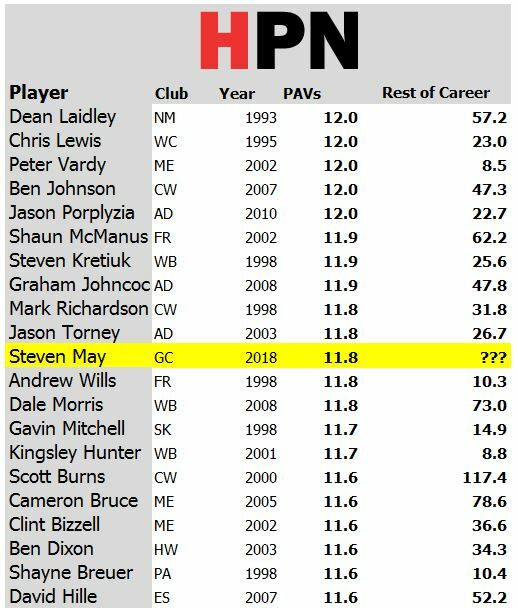 Steven May has long been a cornerstone for a underrated Gold Coast defence – a unit often faced by a barrage of inside 50 entries. May, alongside Rory Thompson, has long years experience of repelling opposition attacks and keeping the game tight enough for Gold Coast’s often weak forward line to scrounge enough goals. At Melbourne, the challenge is a little different. Melbourne are super effective at denying inside 50 entries, but relatively weak at stopping those few entries into scores. May was often the second biggest defender for the Suns, and he may need to step up to the top tier of big forwards in the league alongside Jake Lever, Sam Frost and Oscar McDonald, who are all often more adept at stopping the less bulky, more mobile KPFs. May’s future PAV looks low in our projections, but it appears to line up with the most similar players at the same age. Hepretty consistently misses 4 or 5 games a year and 19 is the most games he’s played in a season, which hurts his value. He may outperform from here, but May is a relatively one dimensional player. Luckily for Melbourne, it is the dimension they need the most. The addition of Kolodjashnij represents a low cost bet on a formerly high rated talent coming off the worst year of his career. Kolodjashnij was tabbed at pick 5 of the 2013 draft, behind Bontempelli, ahead of Scharenberg. He managed 13 PAVs in 2015 – his best year to date – before a slight decline since then. A lot of that had to do with missed games and changed roles, so if the gamble comes off and he returns to his early form, he could be the real steal of this deal. But, if both players perform to their expectations, and the draft is as strong as the experts suggest, then Gold Coast will have continued their strong trade period to date. Verdict: Unfair trade, with Gold Coast getting good value for the two defenders.